Can Kombucha Cure the Dreaded Hangover? It’s Sunday morning, and you wake up with a queasy stomach, dry mouth and a pounding headache. 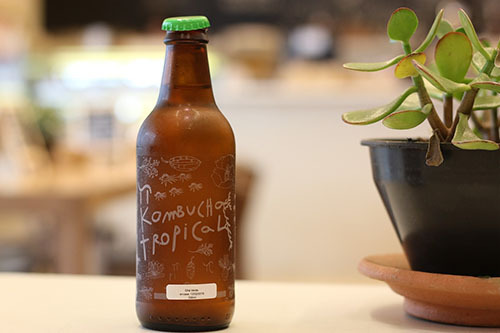 You reach for a bubbly, effervescent, sweetly sour drink that just so happens to contain a trace amount of the stuff that got you here in the first place; this naturally carbonated hangover cure is kombucha! Kombucha is tea, usually black or green, that has been mixed with sugar, water, and the ever-important SCOBY, then left to sit out for over a week. It is then combined with herbs or flavorings, rebottled and then it is finally ready to drink! That boring green tea has magically turned into this naturally carbonated, (good) bacteria-rich, delicious drink for us to enjoy! Sounds a little strange, right? So what the heck is a SCOBY!? Kombucha is left to sit out and ferment, which is the process of your food converting carbs into alcohol. This process creates a ton of good belly boosting bacteria, which is great for digestion. And as for the SCOBY, it’s the most important piece to your kombucha making puzzle. A SCOBY is a symbiotic culture of bacteria or yeast. This weird, slimy, mushroom-looking thing is your essential in creating this fermented drink. It’s what gives this drink all of its amazing health benefits! Let’s be real; alcohol contains toxins. When alcohol is consumed, these toxins enter your body and make you feel not so great the morning after. Kombucha is naturally high in glucaric acid which is beneficial to your liver and aids in the detoxification process. Drinking a glass of the bubbly the next day can help your body’s detox process move along and get those nasty toxins flushed out quicker. We all know that alcohol dehydrates you. When we’re dehydrated, we lose electrolytes. Electrolytes help to control our fluid balances within our body, and kombucha just so happens to be packed with electrolytes. The morning after a night of drinking and you often wake up with a nasty stomach ache. Alcohol depletes the levels of B vitamins found in our body, and this can cause nausea. Most store-bought kombucha is packed with a B complex, helping with your upset belly. Not only that, a recent study has shown that because kombucha is so high in antioxidants, it can help protect the gastric tissue in our stomach and reduce the feeling of pain. Grab a bottle made with ginger or peppermint to really help quell your nausea! Headaches are usually another no fun symptom of a hangover. Kombucha can help crush a headache because of the relationship between our intestines and headache management. Research has found that improving our gut health can play a key role in managing headaches. Keeping our stomachs happy with gut boosting good probiotics from the kombucha can help kick your headache to the curb! Kombucha is chock full of vitamins, like vitamin C, which is essential in the repair of all body tissues. So, sipping on some ‘booch for an added dose of vitamin C can help repair and restore the damage the alcohol did to our tissue the night before. Sometimes a hangover can make us nervous, stressed or even anxious. Kombucha has been shown to having calming effects on the body, so sip away for a sense of relaxation. Let’s all not forget that when fermenting kombucha, it naturally produces alcohol. And although it’s a very small amount, you know how the saying goes, “Bite the dog that bit you”!